How friendship and love can surpass all class boundaries is the story of Arabian duo Aladdin and independent-minded Princess Jasmine. 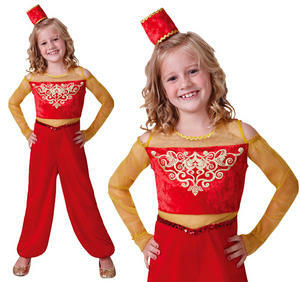 Let you and your partner be cast into this world of wonder and magic with the couples colourful Fancydress 365 Aladdin costume and sweet Princess Jasmine jumpsuit with cute hat and ubiquitous veil attached. 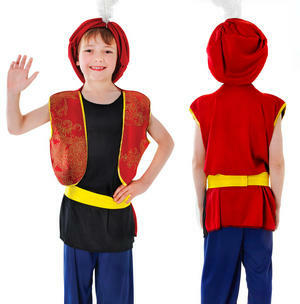 Based on the famous movie produced by Disney, the cheap costumes are unmistakable as the loveable street urchin who was left to fend for himself on the streets aged two, with only monkey Abu for friendship (a stuffed version sitting on the shoulder would make a fine impression of the naughty furry companion). To date Disney has produced three full-length animated feature films involving Aladdin and Jasmine (one of his famous couples). Aladdin and Princess Jasmine (the feisty Princess of Agrabah) meet in a market stall where she's disguised as a normal street trader. Aladdin himself becomes a prince years later after being granted a wish by the genie he finds in a bottle. This really is a unique couples fancy dress pairing.